After graduating from Art College, Pip Shuckurgh embarked on a fruitful career within illustration and commercial art, landing her first complete book to illustrate at the age of 21. Pip has had wide success working largely with watercolour and gouache, illustrating books for Duckworth, Blackie, Mitchell Beazley and the Sunday Times amongst others. Upon fulfilling her long-standing ambition to be a painter, Pip honed her oil painting skills and achieved her first, solo exhibition. Pip has since exhibited in numerous notable galleries across the UK. 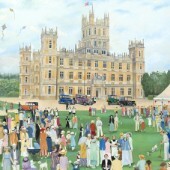 Currently residing in the village of Bampton, the home of the fictional village of UK TV program Downton Abbey, Pip has gained widespread notoriety for her idyllic paintings of the local landmarks.